Foodism – fad or new faith? Today I felt like blogging but didn’t really want to do a “Look at me, I’m a Writer!” blog until after my book tour is over… as I want to then reflect on my month in the spotlight and all the fun I’ve had with it. The main reason I don’t want to is actually covered in this blog… which you will find is a lot about the meanings and interpretations of words and not just me waffling on about food. Yes, I am a Writer first (hence it having a capital letter while foodie is all lower case) and so even when discussing food, I’m really still talking about how we weave our words together to make sense of the world around us. Which is what writing is about. Often, we fictional Writers simply weave a world we wish was real, rather than merely describe the one we’re actually in. In my current series of the Other World I’m often harping on about how words are important. As, you know what? They are, they really are. Because we base our lives and how we live them on how we interpret the words used to teach us how to live. Whether it be the written letter of the law we all must adhere to so as to maintain social cohesion (oh yeah, I did legal studies in High School and that’s about all I remember!) through to what our teachers and parents speak to us on how to be a better person. Those are words and they are important. And whether we take their literal meaning and interpret them one way or take their figural meaning and understand them another… that is what makes the world go round. So although I’m about to talk to you as a foodie, I’m still doing it as a writer. Gosh that was a big waffle just to get out of explaining what a foodie is! I really was just trying to lead up to saying I don’t want to explain what one is because there is no definite explanation or answer! Which is also what this tongue in cheek blog post is all about. But if you must know, my interpretation of a foodie is someone who loves food. Real food. Not instant snip and serve muck… Whole foods, natural foods, the glorious process of knowing where the food comes from, how it’s grown, how it’s cooked and then enjoying the taste. I am very much an old school foodie, so much so I made up an acronym about my food beliefs. Yes, you know how serious a person is when they take the time to make an acronym! Mine is this: I love S.L.O.W food. Food that follows said Slow food principles. Food that is Local, Old (heirloom varieties) and Whole food. Whole food is your basic raw ingredients for those who need that explained too. Now I’m finally getting to the point the title of this post is trying to make, hurrah! The following was originally a post I made on Facebook to my friends a couple of years ago and it met with such appreciative response (friends are like that you know) I decided to turn it into a blog post. I was going to wait until I’d gotten my foodie blog up and running, but it’s been two years now and it’s still hidden out the back of WordPress in mothballs so I’m putting it here instead. You know what I’ve come to realise? Food could turn out to be the next religion – no offence to my religious friends, hear me out! I honestly don’t mean any disrespect to religion… I deliberately avoid talking about it online as it can be so easy to offend some about it. But I’m simply looking at this idea from a faith and belief side of things, not belittling anyone’s chosen God (or Goddess) and all they stand for. Basically, as people have become very passionate about food, nutrition and health in the last few years – their faith in their food principles have become very vocal and almost as passionate as a true religion. There are multiple faiths as to what is the correct way to be healthy and which foods are better for nutrition – backed up on both sides by qualified Doctors and scientists with results that vary depending on who is funding the research and how it effects their products – and depending on how a result is interpreted, fights break out as to its ‘true meaning’. Is butter bad or good? Saturated fats, carbohydrates, wheat, nitrates, sugar! Oh the wars that break out on social media about such things! With these blanket statements from their food prophets and idols, friends become enemies when one feels the paleo is the right faith, where others still think Atkins calorie counting must be adhered to. Can Low Carb, High Fat people still be friends with someone who enjoys rice with their chicken curry? Will a locavore have their membership details blacklisted if they dare include chocolate in their diet that comes from outside their ten mile radius? Let’s not get into the fractured sub faiths within these faiths too. Can a paleo person have dairy, potatoes and peas? Or are they just paleo wannabes and only those who grow, hunt and forage for their own food be the one true followers of the faith? Oh no, won’t someone think of the Vegans! Or the children, won’t someone think of them too! As MAN! catering for a birthday party amidst this all is a torment. 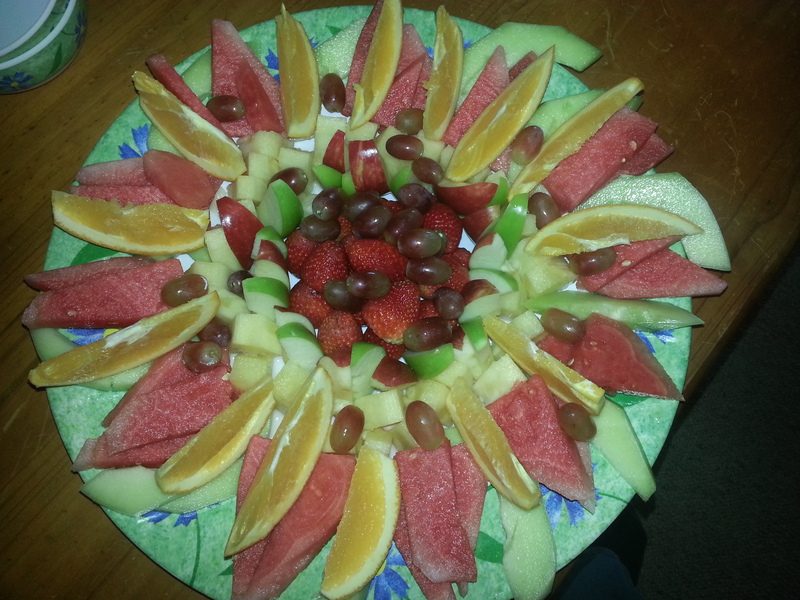 Nut free, grain free, gluten free, dairy free, refined sugar free… I’m so glad I make a mean fruit platter! It’s quite a funny analogy to make isn’t it? Food and the new religion – Foodism. I do hope you realise the high level of humour I’m using as I write this as I’m trying to make light of a crazy situation and mean no disrespect to any of the multiple Foodism faiths… or real religions for that matter. Me, like with religion, feel it’s absolutely brilliant that I live in a country that gives me the freedom to follow what I wish and that personal beliefs are just that – personal. And I also love seeing all the different opinions and options out there and then making up my own mind…. like religion. Though I am now starting to wonder if being into S.L.O.W foods, a balanced diet of all things in moderation, while being as refined sugar free as possible means I’m still allowed to be a Pagan? As I’ve now seen the Light, kicked my sugar addiction and no longer crave chocolate as much as I used to, must I give back the Pagan Chocolate Goddess – May the Fudge Be With You sticker I carry in my purse? I mean, it’s there to remind me I’m not only a card carrying Pagan, but a chocoholic too! Oh heavens, what about the salted caramel hot chocolates I had recently? What penance must I now do to make up for it?